Bring your customer and sales data quickly into your app by importing it. You can import data into most record types. Dynamics 365 processes imports in the background. After an import is completed, you can review which records were successfully imported, failed to be imported, or were partially imported. To fix the records that failed to be imported, export them into a separate file, fix them, and then try to import them again (if necessary, you can start over by deleting all records associated with the previous import). Put records for each record type in a separate file. .csv file: A data file with a .csv file extension. Typically a .csv file consists of fields and records, stored as text, in which the fields are separated from one other by commas. If your import file is a .csv file, make sure that it is correctly delimited. You can use double quotation marks (") or single quotation marks (') as data delimiters. Make sure the first line of the file is a row of column headings. Add column headings (text used in the first row of a workbook or file that labels the data in each column) if they are not already present. Multiple lines in the first line (header row). Quotation marks in the first line. Dynamics 365 uses quotation marks as data delimiters. Data separated with a semicolon (;) or comma (,). Dynamics 365 uses semicolons and commas as field delimiters. Data can be imported more quickly if it can be automatically mapped during the import process. It helps to have your column headings match the display name of fields in Dynamics 365. The display name is the label that is used by default when an attribute is displayed on a form, in a list, or in a report. The Display Name for each attribute can be changed in the Customization area by a user who has an appropriate security role. Make sure data exists for all required fields. 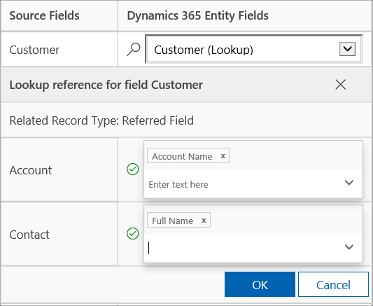 A record will only be imported if all Dynamics 365 required fields are mapped, and if data exists in each of the source columns that are mapped to the required fields. A required field is an attribute that is required before a record can be saved. You can either determine the required fields in advance, or identify missing required mappings during the import. In either case, make sure you have required data in each record. To determine which fields are required, open the form for the record type as if you were creating a new record, and identify fields that are marked with a red asterisk (*). The following list shows default required fields for commonly imported record types. For example, the following lines show what the data might look like for a .csv format file containing leads. The first line contains the field names, and the remaining lines are imported as data. By default, the maximum size of the files that you can import is 8 megabytes (MB). Go to the list view for the entity you want to import to (such as the list of leads), and select Import from Excel on the command bar. If you are an administrator, go to Settings > Advanced Settings > Business Management > Import Data. On the Import Data page, select the record type you want to import the data for, and then in the drop-down list, select Excel. Select Browse to upload a file. Select Next. All the fields in your source file are automatically mapped. Prepare your import file as described in Prepare your file for import. 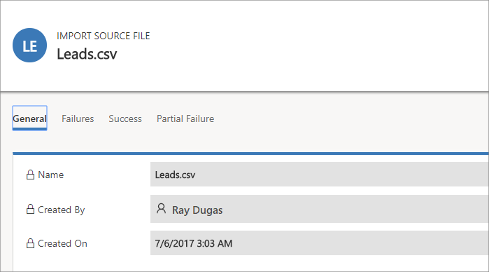 Go to the list view for the entity you want to import to (such as the list of leads), and select Import from CSV on the command bar. If you are an administrator, go to Settings > Advanced Settings > Business Management > Import Data. On the Import Data page, select the record type you want to import the data for, and then in the drop-down list, select CSV. If you have an alternate key defined, select it from the Alternate Key drop-down list. In the Data Delimiter drop-down list, select the data delimiter that you've used in your .csv file. On the Review Mapping page, review how your column headings are mapped to the fields in Dynamics 365. On the left side, by default the Primary Fields section of the Review Mapping page shows all the required fields for the entity that must be mapped for the data to be imported successfully. If you've selected an alternate key, all the fields of the alternate key also become required fields and must be mapped. If the column headings of your source file match the field display names, these fields will be automatically mapped. All the mapped fields will be shown with a green check mark. If the column headings don't match, the unmapped fields will be shown with a red exclamation point. 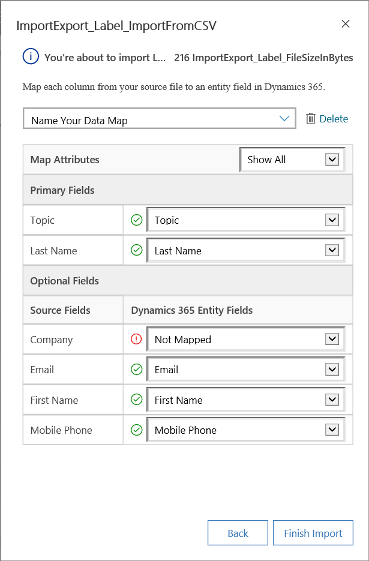 Select a Dynamics 365 field to map to the unmapped column heading of your file. To quickly filter on only the unmapped fields, select Unmapped from the Map Attributes drop-down list. In the Optional Fields section of the Review Mapping page, the left side shows the column headings in your source file. If the column headings match the field display names, the fields will be automatically selected in the corresponding drop-down lists. If the column headings don't match, the unmapped fields will be shown with a red exclamation point. Select a Dynamics 365 field to map to the unmapped column heading of your file. You can also choose Ignore from the drop-down list for one or more optional fields. Data from ignored columns won't be imported into Dynamics 365 for Marketing. For each Source Option Values item, click an item from the Dynamics 365 Option Values list to map it, and then click OK.
After import, the import wizard will add all mapped values to Dynamics 365, but will drop unmapped values from the import file that aren't yet in Dynamics 365. For example, you could map the "Low" source value to the "Cold" target value, but map the "High" source value to the (new) "High" target value. Based on these mappings, the import wizard creates "High" as a Dynamics 365 target value. It does not create "Low" as a Dynamics 365 target value because you didn't map any source to this target value. You can also map a column in your source file to a field of type "Two Options" and "Multiselect Option Set" (where a field can have multiple values). You must map each Source Option Values to the items in the Dynamics 365 Option Values list. When mapping to a field of type "Multiselect Option Set," if your source file includes values that aren't available in Dynamics 365 for Marketing, new values won't be created in Dynamics 365 for Marketing. If some data in your source file references other existing records in Dynamics 365 for Marketing, you must map the column in the source file to a lookup field of Dynamics 365 for Marketing. For example, you might want to import a file named Leads.csv, which contains customer records. The Customer column in Leads.csv contains the associated account or contact data. To map this, select the button next to the lookup field. The Lookup Reference section opens and lists the entities related to the current entity. For each entity, select the fields to search during import to retain the relationships between the records, and then select OK.
To save your mapping settings for next time, enter a name in the Name your data map box. This way, the next time you need to import a similar set of data, you'll be able to use this mapping again. When you're ready to continue, select Finish Import to import that data by using your mappings. The import process creates new records. If a matching GUID is found, the import process updates the record. Records with the same alternate key data are updated, and other records are created in Dynamics 365 for Marketing. In this scenario, the alternate key is considered as the primary key because it is available in Dynamics 365 for Marketing. Records that have the same alternate key will fail with an error message during import. The duplicate detection rule is followed. The import process creates new records. If any matching GUID is found, the import process updates the records. If any records match the duplicate detection rule, an error message is shown. When duplicate detection is enabled and an alternate key is not selected In this scenario, the alternate key is considered as the primary key because it is available in Dynamics 365 for Marketing. Records with same alternate key will fail with an error message during import. Duplicate detection rules are also applied. If any records match the duplicate detection rule, an error message is shown. Records that do not match the duplicate detection rule will be created in Dynamics 365 for Marketing. The import process updates the records based on the alternate key and then applies duplicate detection. Records are updated if the alternate key matches; otherwise, they are created in the system. You must wait for an import job to be completed before you can repair failures. Go to Settings > Advanced Settings > Business Management > Import Data. Import jobs for all recent imports are listed here. After the import is complete, the Success, Failure, and Partial Import columns will show the number of records that were successfully imported, failed to be imported, or were partially imported. Open the import file to view the records that were not imported or were partially imported. Double-click the import file record. Use the tabs to see information about failures, success, or partial failure of records during import. On the Failures tab, select Export Error Rows to export rows that failed to be imported to a new .csv file. You can correct the errors in this file, and then import it. Delete import source file: Deletes the import log file and its details. Delete imported records: Deletes all records that were imported from the selected file. Delete all: Deletes the import file along with the records that were imported from the import file.